Like many things of this world, Glinks is, simultaneously, something very simple and something utterly complex. I will explain the simple side, first, and slowly explain and expand upon what makes Glinks complex and interesting. Glinks, on the simplest level, is a drawing game. 1. Glinks is played on a piece of graph paper. 2. 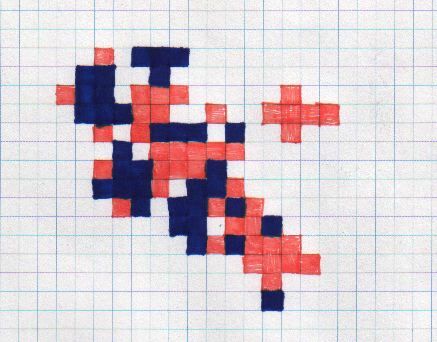 Players agree upon a shape that can be formed by filling in a certain number of contiguous blocks on the graph paper. This shape is called the Glink. 3. Each player chooses their own, easily distinguishable color. 4. The players take turns filling in a square on the graph paper, trying to create the Glink, while simultaneously trying to block the other players from doing so. 5. Squares can only be filled in that are adjancent— horizontally, vertically or diagonally— to a pre-existent square. That is, no new square can be an island. 6. The first player to draw the shape, wins. As an example, the game in Figure 1.1 is a two person game— one on blue, another on red— both trying to create the 6-cell crucifix, that you see in the upper left corner. After a quick inspection of the game, you'll see that red won in the lower left hand corner, on the 69th turn. This is, again, the simplest level. And, as far as fun and fascination go, roughly on par with Connect Four, which is itself a variant of Glinks, conditioned by the force of gravity. So you stop here, and still have plenty of fun with graph paper. But aside from just the fun of the game itself, one of the many things that tantalizes me about Glinks is the pattern that emerges from play. This pattern is not a pattern in the usual sense of blocks of repetition, but rather a graph of competing forces. A form created by vying strategies. Or as Owen put it, "a kind of bounded chaos," which depending on the strategies and the choice of Glinks rules, will create different patterns. So one way that I'm interested in this game and its variants is as a fun, colorfilled game-theoretical model, a phenomenon that is its own representation. Each completed game becomes a sense-laden document of the play— as well as game itself, to find the Glink in the mosaic. So I picture Glinks as an elementary model of the compromise of forces, and therefore, a perfect starting point for more complicated things to come. Which brings me to another aspect of the game, which is the production of new variants. The initial starting point, the Beginner's Game stated above, is just a basis on which to create variants. And this second level of Glinks is, for me, a fundamental part of Glinks itself; where the game really begins. In Figure 1.3 we have a game between three players. However, instead of all trying to create the same Glink, each player has chosen their own: the three shapes floating to the left of the mosaic. We see a blue staircase, a pink rectangle, and a purple 6-cell line. , and numerous as-yet uninvented parameters. The ultimate trick is to bend these parameters to represent other phenomenon. But analysis aside, Glinks is also a generative game. That is, you're not just playing a game, you're also creating a mosaic. The closer two players are in ability, the larger the mosaic. The ideal for pattern creation is, then, playing yourself; in which you're playing with more-than-perfect information, and suitably relaxed to just let the mosaic work out according to lazy strategy. If the games are too short, another variant allows for continuous play on the same piece of paper, either by starting a new "island," or by just counting the Glink as one point and continuing play. In Figure 1.4 , we see the first game continued, with five Glinks for red and two for blue, not to mention a fairly pleasing composition in the end, with its own hidden order. This hidden order would probably be far less hidden if everyone was playing perfect games, and so we could get certain patterns from strategies in equilibrium, or Nash equilibria. We would expect humans and computers to create very different mosaics.